Some of the most popular species in the aquarium hobby, such as bumblebee gobies, are actually not freshwater fish but require a brackish tank. If you want to set up an aquarium for one of these species one thing you’ll need to think about is plants: most aquarium plants don’t appreciate being exposed to salt at all, which can make planting very challenging. Luckily, there are still some options, especially for low-end brackish tanks! Keep reading for a list of 8 hardy plants that can be grown in a brackish aquarium. Are you also looking for fish to stock your brackish tank with? There are more fascinating salt-tolerant species out there than you might think. You can find a list of 6 brackish aquarium fish here! Another brackish aquarium favorite, Anubias is a super tough aquarium plant that can thrive in a wide range of water values and lighting conditions. A little bit of salt shouldn’t be a problem for the highly adaptable Anubias as long as you take care to acclimate the plant very slowly. There are many different types of Anubias available, all of which should be able to tolerate salt to some degree. Anubias barteri is probably the toughest and most common type, while Anubias nana (pictured at the top of this article) stays very small and might be a good choice for smaller aquariums. Like Java fern, Anubias is a slow grower should be attached to rock or driftwood instead of planted in the substrate. You can find a full Anubias caresheet here. Taxiphyllum barbieri, better known as Java moss, is one of the most popular plants for brackish aquariums. It can make a decorative cover for rocks or wood or even be left free-floating to provide refuge for fry and other shy aquarium inhabitants. Specific water values or lots of light aren’t necessary for this undemanding moss, which makes it a good option for beginners. To keep your Java moss healthy in a brackish aquarium, don’t just plop it in there! Acclimate carefully. Once the plant has adapted and starts producing new growth be sure to trim regularly to prevent the middle part from being deprived of oxygen and turning brown. It’s on the list of 8 easy aquarium plants for a reason. Microsorum pteropus, also known as Java fern, is a super hardy plant that has no problems with being exposed to low-end brackish water! As long as you take the time to acclimate it, it should be able to adapt to the salt grades required by many aquarium fish. Don’t place Java fern in the substrate. This rhizomatous plant will quickly wither if its roots are buried, so attach it to driftwood or porous rock types using fishing wire or superglue instead. Keep in mind that it’s a rather slow grower; don’t get discouraged if you aren’t seeing a lot of new growth on your Java fern right away. Just give it some time and it’ll eventually spread out into a beautiful fan shape. You can find a full Java fern caresheet here. Its common name says it all: although Samolus valerandi can be found in many different habitats, one of the places it grows is the seaside. This has made it tolerant to rather high salt grades up to high-end brackish! That’s not something many plants can handle. Definitely not the easiest plant, but when provided with the right conditions its compact growth pattern makes it a decorative foreground option. To keep your brookweed alive in the long run, provide it with plenty of light and don’t introduce it in high-temperature tanks; anything below 77 °F/25 °C should probably work. Keep in mind that this species is usually grown emersed and it might take a while to adapt to life as an aquarium plant. Although it needs quite a bit of light to thrive, anacharis is a good option for low-grade brackish aquariums. It isn’t called waterweed for nothing: under the right circumstances this plant can grow very quickly, making it a great nitrate buster that can help outcompete algae. Anacharis can be grown as a background plant and you can easily create a dense ‘forest’ by replanting trimmings. It can also be left free-floating to provide extra cover or if you’re not using substrate. Note: anacharis is often sold with rubber bands or a piece of sponge holding the stems together. Be sure to remove this and plant the stems separately. 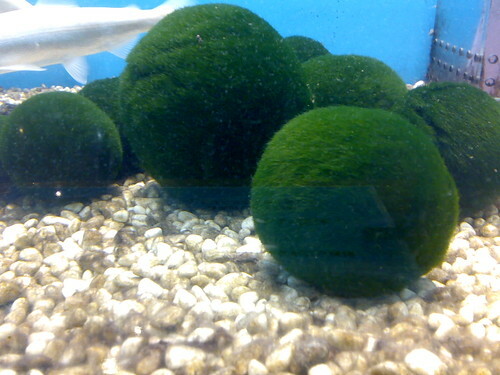 Marimo moss balls are actually a type of algae (Cladophora) that naturally grows into a round shape. Although algae are not actually plants, Marimo balls are still included here because they can tolerate an impressive amount of salt. In fact, they should do absolutely fine up to mid-grade brackish water, which makes them a great decorative option for those setups that have a little too much salt for many of the other species on this list. Marimo ball care is not challenging at all and these algae balls adapt easily to a wide range of water values as long as the transition is gradual. Do keep in mind that they naturally occur in cool waters, which means very high temperatures are not appreciated. 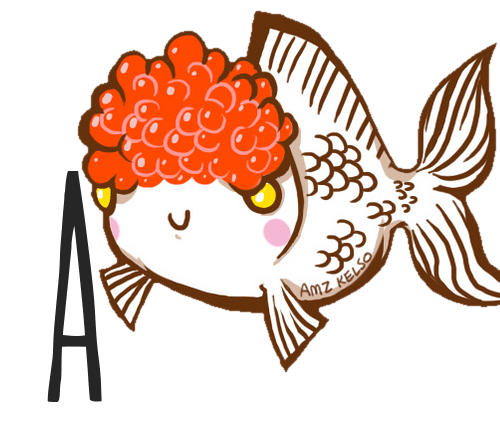 You can find a full Marimo ball caresheet here. Although it’s not the best choice for a low-tech aquarium, moneywort can work very well in brackish tanks up to mid-grade salinity when provided with the right care. This means it handles a bit more salt than most aquatic plants and is a good option if you’re having trouble keeping plants alive in your brackish setup! Like many stem plants it needs quite a bit of light to thrive and appreciates extra nutrients. Healthy moneywort makes a great accent plant for the middle parts of the aquarium and as with anacharis, a full look can easily be created by replanting trimmings. 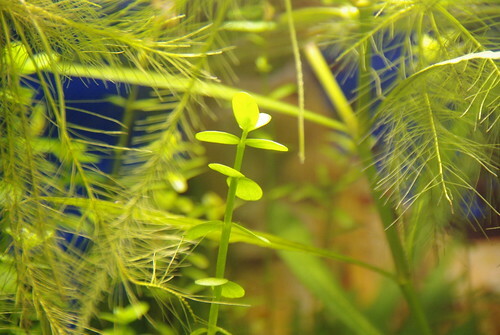 If you have any more questions about these brackish plants or want to share your own experiences with planting a brackish aquarium, don’t hesitate to leave a comment below! I keep reading dwarf hair grass is fine for brackish… I was wondering if regular hair grass would work since its easier to grow than dwarf? The best quick review of brackish plants I’ve ever seen. Thank you.